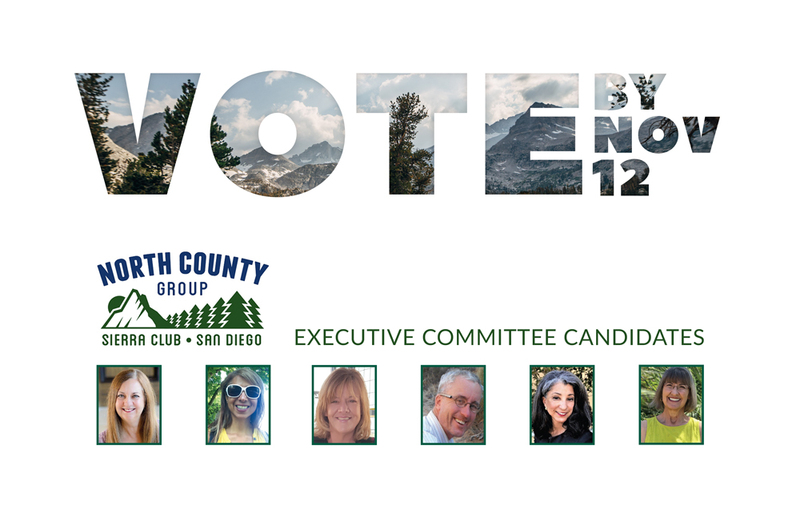 Vote: North County Group Executive Committee | North County Group – Sierra Club S.D. Ballots are out and voting is on for the North County Group Group Executive Committee. The Sierra Club North County Group (NCG) is holding elections to fill four vacancies on its Executive Committee. The NCG Executive Committee has overall responsibility to assure that the activities and services provided for the members are consistent with the bylaws, rules, and policies of the Chapter and National Sierra Club. These activities may include outings, membership services, financial management, conservation and political programs. The Executive Committee meets monthly and attendance is expected. Make sure you get your ballot in the mail in time to be delivered by November 12. Committee members are elected to serve a term of two (2) years. You can vote for up to four (4) candidates.